Tips and Tricks for Pubs is a weekly series focusing on the best strategies for succeeding in pubs. One of the fastest and most efficient ways to accrue a large amount of gold in jungle is through creep stacking. 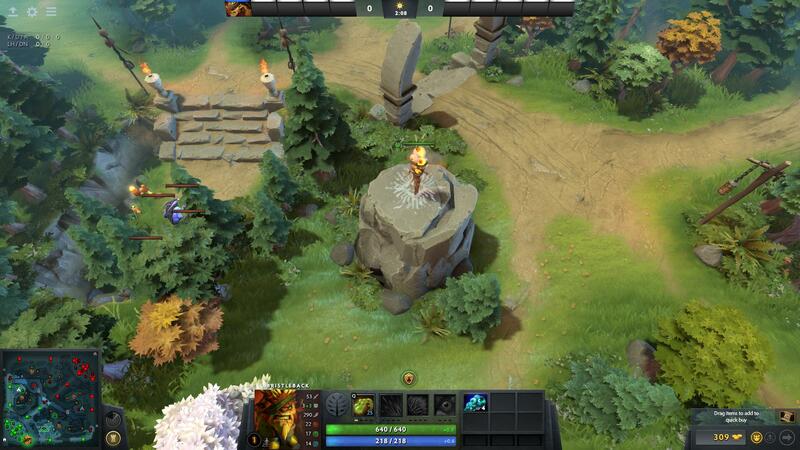 If a player aggros a neutral creep camp in the jungle and pulls them outside of their spawn box when a neutral camp is due to be spawned, two copies of that camp will appear at the location. With twice the creeps to kill, you can earn more gold in less time than it would take to kill and wait for a new stack to spawn. Creep stacking is simple in theory, but difficult to master in practice. Keeping that in mind, here are some Do's and Don'ts for stacking creeps. Due to the changes in the 7.00 update, the spawn time frequency for camps was reduced from 0:30/1/2/3/4/etc. to 0:30/1/3/5/7/etc. While you could miss a stack pre-7.00 and still be fine due to the frequent spawn times, the changes mean that a missed stack could be the difference between an early Blink Dagger and several more minutes of waiting around. As such, if you're in the jungle looking to stack a camp, keep track of the time so that you don't miss a stack. Each camp is pulled at a different time, but a general rule of thumb is that most camps should be pulled around the 54 second mark. So keep your eyes glued to the clock, because a mistimed pull is all that is needed to lose out on a lot of farm. Creep pulling is an advanced technique where you pull a stack of neutral creeps towards the lane so that they connect with the advancing lane creeps. With the creeps occupied with each other, you can take the time to recover some health and mana while safely securing camps or creeps that would otherwise be difficult to take. But pulling this off is difficult, requiring a greater understanding of timing and your capabilities than simply stacking a camp. It's a risky maneuver, as stacking creeps is a much safer and more viable option in most situations. Support players, do you want to make your carry very, very happy? Then don't be afraid to creep stack for your team. As the carry is normally meant to stay in the safe lane and farm for the first 20 minutes or so, they have little opportunity to stack creeps themselves. As a support, you may not be able to kill the creeps efficiently by yourself, but stacking them for your teammate will pay dividends as the game transitions out of the laning stage. This point cannot be stressed enough — ward the jungle so you can both keep track of the camps on your side and to prevent your opponent from creep stacking at the same time. Knowing which camps are open and which camps are ready to be stacked is important to botch creep stacking and for maintaining control of the jungle. Furthermore, placing a ward inside a camp in the opponent's jungle will prevent additional creeps from spawning. In the same vein, use sentry wards to uncover enemy observer wards in your jungle so that they can't do the same thing to you. Preston Dozsa is a news editor for theScore esports. You can follow him on Twitter.